Home > Ask Our Experts > How do I Care for my Chilid Fish? Q.I purchased a pair of Cichlids this weekend and fear as I am new to keeping tropical fish that the shop owner has given me the incorrect information and certainly the wrong size tank. 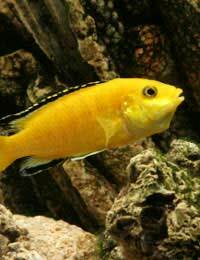 They were sold as a pair of Cichlids from America who were brought into the shop as they were too aggressive for the previous owner. The male is about 4inch long and female about 3 and apparently they have not grown for a year. After spending some hours on the internet I think they however look like Jaguar Cichlids and I am worried that they will out grow there tank very soon as it is only a 40" cube. The other worry I have is that the tank has now got a strange smell and the fish who were quite active are feeding less and hiding more. I fear I have been very naive but now want to do the best for the fish. What shall I do? First of all, don't blame yourself. We all make mistakes and it's really the job of fish shop owners to know what they're selling - unfortunately some seem to be deliberately underhanded about it in order to offload problem fish. It's good of you to try and do the best thing for these fish regardless. Unfortunately, if you're going to look after them in the long term, you are going to need a bigger aquarium. This doesn't mean it has to be overwhelmingly big - 70 gallons should be sufficient in most cases. Because these fish need space to move around in, rather than just a large surface area, you can consider purchasing a taller tank rather than a wider one if that makes it easier to fit something suitable into your home. The good thing about big tanks is that they can actually be easier to care for, rather than harder, because the increased volume of water means the water chemistry will be more stable. Jaguar cichlids often grow quite slowly and it's probable that being in a small community tank previously kept these fish smaller than they would otherwise be. However in order to be healthy they should have room to grow properly. The good news is that they're generally hardy, healthy fish and relatively easy to look after. It sounds as if the problem you have at the moment is a water chemistry imbalance. Read our pages on water chemistry and aquarium water parameters to find out how to manage this sort of thing. I recommend buying a test kit from your local fish shop. These are cheap and easy to use and will tell you what your current water parameters are so that you can make adjustments. In the meantime, do an immediate water change, getting rid of about one quarter of the water currently in your aquarium. With fish like these you should adopt a routine of changing about a fifth of the water once a week, leaving the replacement water to stand overnight or (ideally) treating it with a conditioner like Tetra Aquasafe. Once the condition of their water improves, your fish should become happier and more active. Be careful not to overfeed them (make sure they eat everything they're given within five minutes) and try to give them an interesting environment with plenty of hiding places for the female to use when she's being chased. With a bit of luck, they'll be just fine, and you'll find them very rewarding pets. Can anyone help? I have a cichlid who's rear tail section seems to be limp and is having trouble swimming around. I have quarantined him in a spare tank and have treated him with health plus, yet still no improvement . Any ideas ? ?